You may be at the age where you feel more conscious about your looks because of your age. You may be considering having some work done but you just don’t feel like you need a surgery just yet but a laser may no longer work. The good news is, there is an option in between. Threadlift in Thailand, a non-surgical, minimal invasive procedure which gives an instant, subtle lift that restores the youthfulness of the face, is now one of the most sought after facelift procedure in the world of cosmetic surgery. Threadlift in Thailand is a lifting procedure wherein our surgeon, Prof. Somyos Kunachak, makes use of special threads to lift sagging eyebrows and eyelids, deep nasolabial folds (those furrows between your nose and the corners of your mouth), mid and lower face, jowls, or aging neck tissues. With Multiple threadlift in Thailand, tension is created to pull the skin and tissue in the direction which tends to lift the skin. The threads are then anchored to stronger tissues to fold it in place. 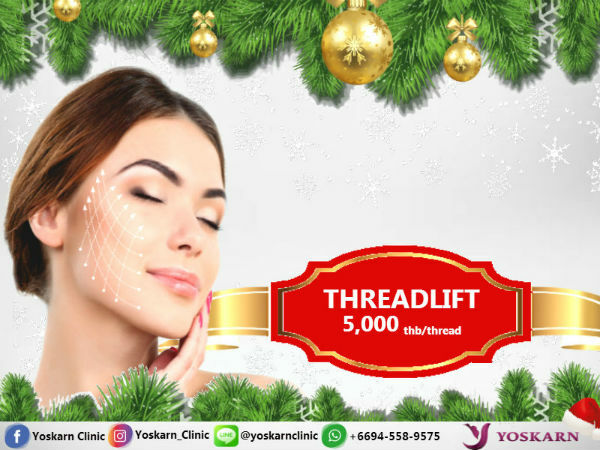 Another innovative threadlift techniques available at Yoskarn Clinic are the Barbed thread, U-Cog thread, and the Silhouette Threadlifts. WHO ARE THE CANDIDATES FOR THREADLIFT in Thailand? Good candidates for multiple thread lift are those who are just showing early signs of aging or those who have tried laser treatments and saw no results. Laser treatments are good for rejuvenation, but it no longer works once sagging starts to show. Threadlift is also the best option for patients who are considering a lifting procedure but are not yet ready for an invasive surgical approach like a facelift surgery in Thailand. People who are considering threadlift should be of good health with realistic expectations regarding the result of the procedure. For advanced stages of aging, Facelift in Thailand is the procedure we usually recommend. HOW IS THREADLIFT in Thailand DONE? Threadlift in Thailand is done in an outpatient setting under local anesthesia. A certain number of threads will be inserted through a special needle on the areas that you and our surgeon have discussed during your personal consultation. After the threads are inserted, the surgeon and his team of nurses will allow you to relax before you get discharged. The procedure takes less than an hour and there is basically no downtime afterwards, however, some bruising and swelling may occur. Our clinic takes pride in providing our patients warm welcome whenever they visit. This is evidenced by a number of our clients staying with us for years and some even decades. Even with our long history, we make sure we keep up with the latest in the field of cosmetic surgery and skin rejuvenation. We also make use of only quality products for our threadlift procedure. WHAT RESULT CAN YOU EXPECT AFTER THREADLIFT in Thailand? Threadlift brings back the youthful look of the face without leaving any incision. In cases where excess skin is present however, threadlift may not work since the procedure will not involve excess skin removal. Deep lines and folds on the face may be improved by threadlift in Thailand but they will not be totally erased so a combination of another procedure may be done such as filler injections or fat transfer. The result of threadlift in Thailand is not permanent but it can last for 1-3 years depending on your lifestyle and skin tone. Usually, patients who had undergone this procedure usually come back for just a little touch up a few years later. WHAT HAPPENS TO THE THREAD? 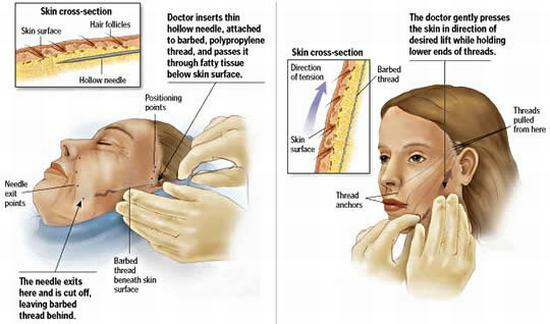 The special threads used for multiple threadlift in Thailand are absorbable in 6-9 months. The threads are Collagen-based so it will press no harm for your body and though tissue rejection may happen as it is still foreign object, but is very rare. Since threadlift involves no surgery or incision, there is typically no downtime. A little swelling and bruising may be observed especially on the areas where the threads were inserted but it usually resolves in 3-4 days. Cold compress may help minimize swelling especially when applied just after the treatment. Bruises may be covered with make up a day after the treatment if you really have to go out and you want to mask the bruise, but leaving the area to just heal will be a lot better. Pain is usually very minimal if there is any. Redness may occur but on very rare cases as well. Patients who had done threadlift procedure in Thailand can usually go back to work the day after.